BLACKFIRE Paint Cleaner is a remarkable finishing polish with a built-in glaze for the ultimate "wet-look." It visually reduces swirl marks while creating a deep gloss. It removes old waxes and sealants and cleans the paint's surface to prep it for a shiny coat of wax or paint sealant. 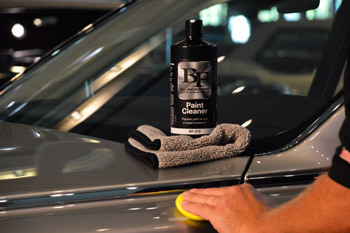 Used before a wax or sealant, BLACKFIRE Paint Cleaner improves the gloss and clarity of the finish. 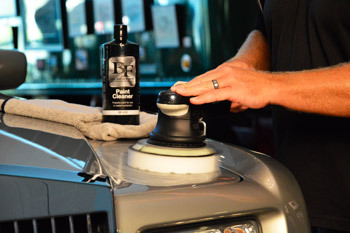 Professionals and enthusiasts know that polishing is must for a show car shine! BLACKFIRE Paint Cleaner is a pre-wax cleanser, non-abrasive polish, and glaze combination. It wets the surface to create the illusion of the paint being under water. This hides minor swirls and scratches without removing any paint or clear coat. It "rounds-over" the leading edge of minor swirls which robs sunlight of a sharp edge to cause a reflection. While this visually reduces swirls, it does not remove them. This is a great product to use on a vehicle in good condition with very few swirls. Use Paint Cleaner to remove old wax, clean the top paint surface, visually reduce swirls and deepen the paint's gloss prior to wax or sealant application. It is extremely effective on all paint types, from antique lacquers to modern scratch resistant clear coats. When used under BLACKFIRE Paint Cleaner, it's pure magic! The combination of Paint Cleaner and Wet Diamond creates a liquid-like wetness that looks like you could reach into the finish. This combination is especially stunning on black, red and dark colors but still shimmers on white, grey and silver finishes. If you have a show car, concours car, hot rod or just want a show-car shine on your daily driver, use BLACKFIRE Paint Cleaner and follow with a top coat of BLACKFIRE Paint Sealant. To use BLACKFIRE Paint Cleaner by hand, apply a nickel-size amount onto a microfiber or foam applicator and wipe onto the paint �using a circular motion until a haze starts to form. Remove immediately using a microfiber towel. Apply and remove to a small section at a time. To apply �with a dual-action or rotary polisher, use a finishing or polishing pad at medium speed. Work a small section until a haze starts to form and buff off to a brilliant shine using a microfiber towel.